Striker Spencer Weir-Daley, who represented both Nottingham Forest and Notts County, recently returned to a club where he enjoyed a prolific previous spell and he also continues to get on the microphone in his time away from the field. The 26-year-old made the breakthrough in professional football at Forest and is now in his second stint at Boston United hoping to rediscover the form from his first stay to help engineer an outside shot at the Conference North play-offs. Also a former Lincoln City, Macclesfield Town and Bradford City player during his time in the Football League, he has been putting his energy in his spare time into a side project which started some time ago with his cousin James Brown (known as Dark A Disciple). “It’s no secret to people who know me that I love hip-hop and I started doing my own music from a young age just for fun, but the feedback we were getting from people in our area was good so in later years we formed a group called DragonHearts. We’ve made a lot of music locally in Leicester where I’m from and are in the process of releasing our second mixtape online via YouTube, MySpace and MediaFire and are planning to shoot videos for them. 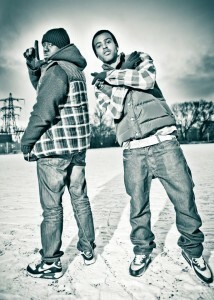 Leicester hip-hop duo DragonHearts: James Brown (left) (Dark A Disciple) and Spencer Weir-Daley (right) (Soulja Swizz). The artists at the top of Spencer’s collection are as you can imagine some of hip-hop’s long-established acts, and this leads nicely on to some of his well-known former colleague’s music tastes from those days at The City Ground and Meadow Lane. “I’ve got time for a few different genres but it always comes back to rap/hip-hop – I can’t live without it. All types of artists, old and new school but my favourites have to be US rappers such as Nas, Mobb Deep, Cam’ron, G-Unit, Jadakiss etc. “The first thing that comes to mind is a tape I recorded when I was 12, it was from ‘The Tim Westwood Show’ on Radio 1 every Saturday night. From then that was it for me, I knew what music I liked, then I begged my Mum for US rapper DMX’s album ‘…And Then There Was X’, that was my first ever CD. “Probably the worst (of past teammates’ music tastes) was some of the older players at Forest, the likes of Jack Lester, John Curtis, Nicky Eaden, David Johnson and Dan Cullip – they liked a lot of older power-ballad-type music! Sing-a-long stuff that ain’t me, and a lot of indie bands, I don’t want to be hearing that in the changing room! 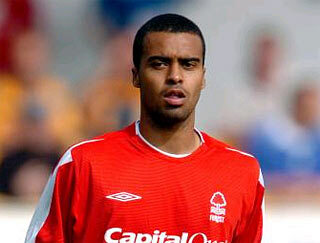 Former Nottingham Forest striker David Johnson - one of the bad ones for music taste according to Spencer! Known as ‘Soulja Swizz’ when it comes to music, Spencer’s on-field debut came in August 2005 in a home defeat for Forest against Macclesfield Town in the Carling Cup. He scored four days later in his first League One appearance, in a 3-1 victory away at Gillingham, and his manager at the time was Gary Megson. Current Sheffield Wednesday boss Megson is renowned for his ‘no nonsense’ approach and inherited a Forest team struggling in the Championship after Joe Kinnear’s resignation in December 2004 and Mick Harford’s interim reign in the following weeks. While he enjoyed two promotions into the Premiership at West Brom and later saved Bolton Wanderers from relegation from the top flight, Megson failed to revive Forest’s fortunes and it is known that some of the underachieving players at the time did not react well to his style. “It was definitely an eye-opener for a young player coming in working with a big-name manager in the game and he had a very hard and strict mentality for everything from the start. I remember his first day, there was no easing in with the players, he was straight to the point in a team meeting, shouting that we were underachieving. “I don’t think he went down well with the players, especially the older ones who probably didn’t like the new tougher regime we were now on, but it was an easier transition for me in that I’d just come out of the academy which was quite strict anyway. He was good for me as he believed if you were good enough you would play regardless of age and experience. 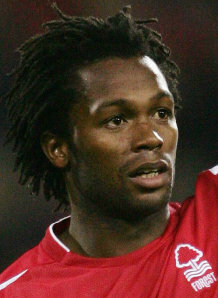 While still a Forest player Spencer went out on loan three times in the 2006/07 season, firstly to League Two sides Macclesfield Town and Lincoln City, before stepping back up to League One with Bradford City. “Macclesfield got me playing regular games which I enjoyed even though we were low in the table at the time, I realised how lucky we were at Forest in terms of facilities, kit, everything. I got a couple of goals but Brian Horton was sacked then Paul Ince came in and didn’t play me so I went to Lincoln. “My first game was against Macclesfield and I was getting booed for some reason! Lincoln was really good, they were riding high in the league and had a really attacking side which suited me and I scored a few, some in live games on Sky which was good for me. Back at Forest, Spencer’s last game for the club came in May 2007 in a 2-0 win in the first leg of the League One play-off semi-final away at Yeovil Town. He was left out of the second leg at The City Ground where Yeovil stunned the hosts to win 5-2 after extra-time, overturning the aggregate deficit and booking their place at Wembley for an ultimately unsuccessful clash with Blackpool. The Forest memories are good for Spencer looking back, although he harbours a slight regret in choosing to move to Notts County in his quest for a more regular run of games. “I loved to be there and also as a kid to play in front of 20,000+ fans, that’s where I learnt the game and my best moment was scoring on my league debut, I’d been there since 10 years old so to do that was a big moment for me. I am from Leicester but never supported them (Leicester City), I’m actually a Man United fan, then Forest would be my next team I support. “To be honest (moving to Notts County) was a bit of a nightmare looking back, maybe I made a mistake going there, I could have stayed at Forest but I didn’t want to be a squad player. Even though I loved Forest I was disappointed to be left out of the play-off semi-final second leg with Yeovil and was desperate to play regular football. “I turned down other clubs to go to County but when I got there the style of play wasn’t something I was used to, the team began to struggle, we had good players but couldn’t gel. The manager (Steve Thompson) was sacked two months into the season then the new manager Ian McParland came in, let’s just say things went from bad to worst! In December I spoke to Exeter City’s Danny Coles about his time playing for both Bristol City and Bristol Rovers, and with Spencer I wanted to get his take on how playing for Nottingham’s two professional clubs felt. After a very brief stop at Ilkeston Town he signed for Boston United in October 2009, scoring 21 goals in 28 starts that season as the team won promotion to the Blue Square Bet North (Conference North). Boston had been relegated from the Football League in 2007 and amid ongoing turmoil off the field they were demoted once more as a result, to the Conference North for the 2007/08 season. As they remained in administration by May 2008 they were relegated yet again, to the Northern Premier League, despite a 10th-place finish. Spencer, after helping them to promotion and scoring a further 14 goals last season, then left the club, and before joining up with AFC Telford he scored 4 in 3 games for my hometown club Buxton. For those who do not know, Buxton is a spa town in Derbyshire and a tourist attraction known to many for its famous bottled water and thriving nightlife (well most of that is true)! “Yes Buxton I was there for two weeks, to get some match fitness before signing for Telford. I didn’t get a chance to see the town or the amazing nightlife which was unlucky for me! 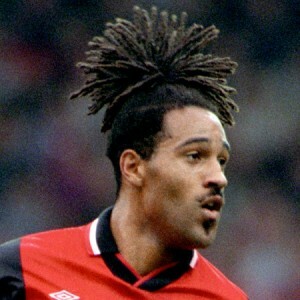 He has now rejoined Boston and his joint-manager there is another former Forest striker Jason Lee, a firm part of 1990s Premier League folklore due in no small part to his famous haircut which brought about a series of sketches from Baddiel and Skinner in his honour. 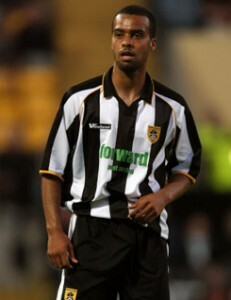 Current Boston United player/ joint-manager Jason Lee in his days at Nottingham Forest. With Boston 11th in the league and 11 points off the play-offs at present it will be a big challenge for them to gain promotion to the Blue Square Bet Premier (Conference) this season but Spencer is enjoying his return to familiar surroundings. I want to conclude this feature with Spencer highlighting some of the standout players and managers from his career to date, as well as having him reflect on how life can change once a footballer leaves the relative security of England’s top four divisions. 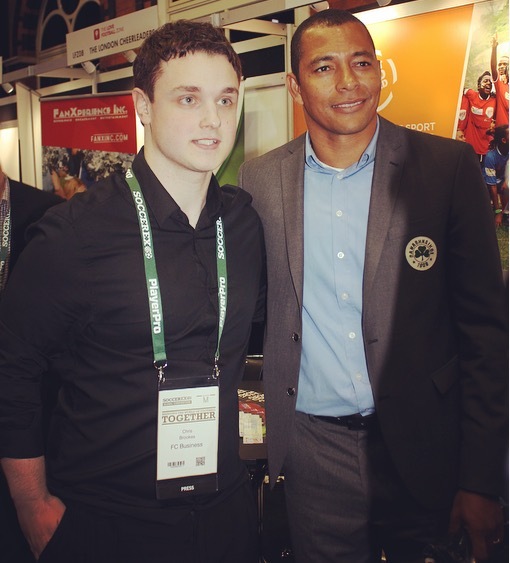 “Probably the best I’ve played alongside would be Kris Commons, Des Walker, Darren Huckerby, Jack Lester, David Wetherall. Most difficult opponents have probably been Gary Cahill when at Aston Villa, Alex Baptiste at Blackpool, Zat Knight, and Kieran Richardson when at Man United, he ran the show in a youth team game. “I enjoyed working with Gary Megson for the experience and the chances he gave, Colin Calderwood, and his assistant David Kerslake is good. Also John Pemberton my old youth team manager, John Deehan and John Schofield were good at Lincoln City, Rob Scott and Paul Hurst who are now at Grimsby were good to work for. “I think Jason Lee and Lee Canoville will go on to be good managers. I’ve only had one, possibly two difficult managers, I think my second manager at Notts County would be top of the list, followed by another recent manager but that’s it I’m easy to get on with. “I’d say life changes a lot outside of the league, contracts and clubs are less secure with the amount of financial trouble going on these days. Clubs can just turn around and say ‘we can’t pay you anymore’, which is happening to a few friends of mine in the game right now. Next Richard Lee interview: Team playlist choice seals Eger’s fate!